If you've spent a good deal of hard earned on your acoustic-electric, a cheap acoustic amp is probably all you can afford (which is, I presume, why you're here!). Acoustic guitar amps, more so than electrics, should be transparent enough to feed through the full tonal character of your instrument and provide enough volume for live shows and gatherings. They should also include useful performance features such as additional inputs (e.g. for a microphone). Summary Practice, recording & very small venues. Lightweight. 2 channels. On board chorus. Bright, clear sound. Practice, recording & small venues. Lightweight. 2 channels. Aux input. Loud for its size. Small-mid size venues. Independent channel EQ and effects. XLR output for studio. Footswitchable. 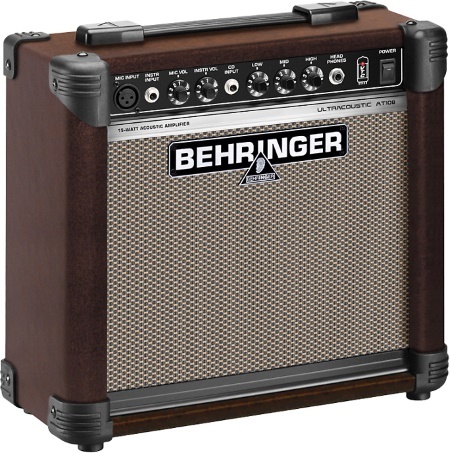 For home practice, the studio or small intimate gatherings, this lightweight, 15 watt Fender has more than enough power and presence. It benefits from two channels (one mic, one instrument), each with independent volume controls. As well as a standard 3-band EQ on the instrument channel, there's the added bonus of a chorus effect to give your instrument tone some shimmering saturation. The headphone socket can also be used as a standard 1/4" line out for basic, un-mic'd recordings. The crisp Fender clarity people have come to expect from their electric amps is also present in the Acoustasonic, thanks to the "whizzer" coned speaker. It's only a 6" speaker, but for those non-intimidating, quieter gigs and home practice/recording, you'll have enough output to be heard. There's certainly more emphasis on the treble, sacrificing the low-end somewhat, so if you're acoustic is already bright sounding you'll need to give the pickup and amp EQ some attention to balance things out. However, if you're looking for more mid-high range clarity then the A15 will deliver that. Slightly beefier output than the Fender due to its 8 inch, dual cone speaker. Two independent volumes control the mic/instrument channels and there's an additional auxiliary input for connecting your music device. The AT108 boasts "Virtual Tube Circuitry" for tube-like emulation, giving it a slightly warmer sound than the 15 watt Fender. There's also a touch more bottom-end in the AT108 and overall more volume for slightly larger venues. 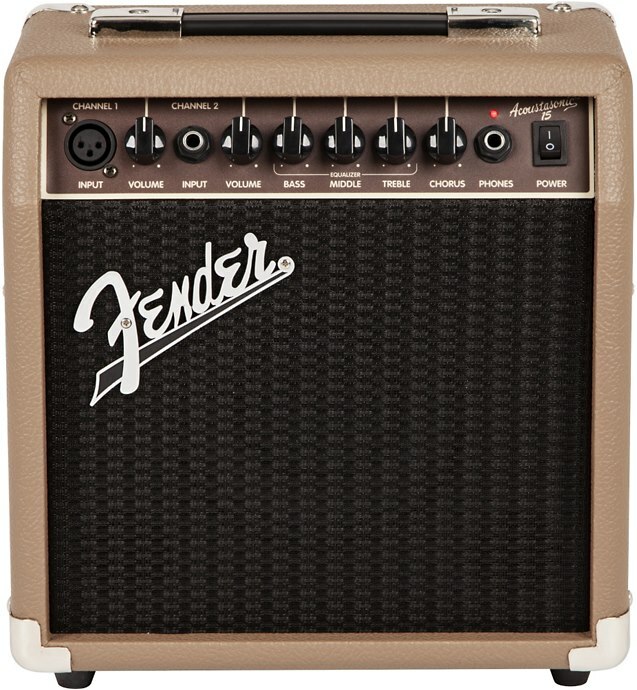 So it seems the 15 watts have been used more economically than other practice sized amps in its price range. Like the Fender, it's lightweight enough for even a child to carry, so you won't break your back negotiating stairs and it won't hog your trunk space. What it lacks is chorus, reverb or any other on board effect. So this is a basic amp more suited to those who want a "purer" acoustic sound, or those who have their own external effects units. 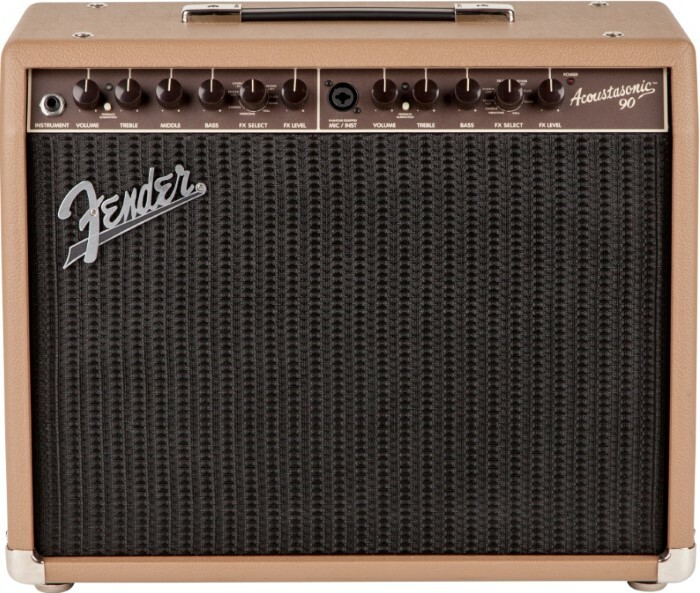 In short, impressive power for such a compact amp, and delivers a natural, full acoustic tone. 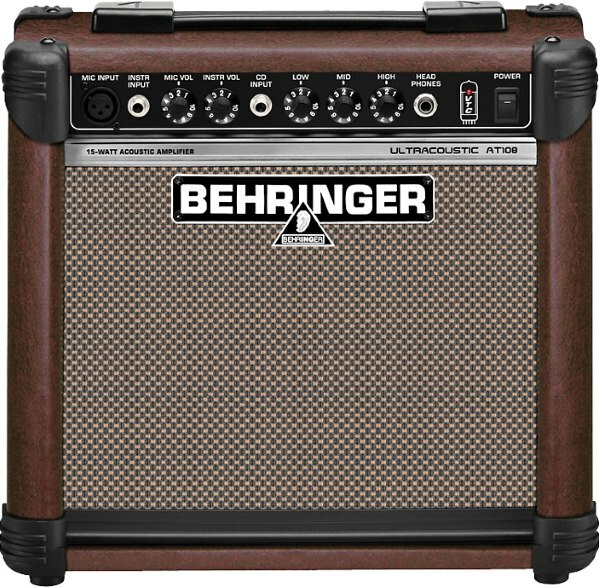 The most powerful of the 3 picks, at 90 watts, giving you enough volume for mid-size gigs. Naturally, with a larger amp comes more features, such as independent EQ's for both footswitchable channels and even independent effects, which is unusual for an amp this price. So you can apply different effects to each instrument you plug in, or just keep them on for one channel. Running through the on board effects on each channel, we have a decent selection: vibratone, chorus, delay, reverb and combinations such as reverb + delay and reverb + chorus. On the front you'll also notice a "feedback elimination" button, again one for each channel - useful for those volume cranked gigs when using an acoustic or hollow body instrument can cause serious feedback issues. On the back we have an XLR output for balanced recordings and an auxiliary input to connect your media player. Compared to it's 15 watt baby, the 90 delivers a much richer sound that will fill out larger venues nicely, ensuring you can play with a band as well as solo. Surprisingly, the 90 watts only drive an 8" speaker (same size as the Behringer 15 watt), but users haven't had any issues with volume or presence when performing. If you've previously been running your electro-acoustic through an electric guitar amp or PA system, you'll instantly hear a huge difference through the Acoustasonic and your acoustic performance will be given the presence and articulation it deserves.